Everyone loves a budget beauty gem, am I right or am I right!? 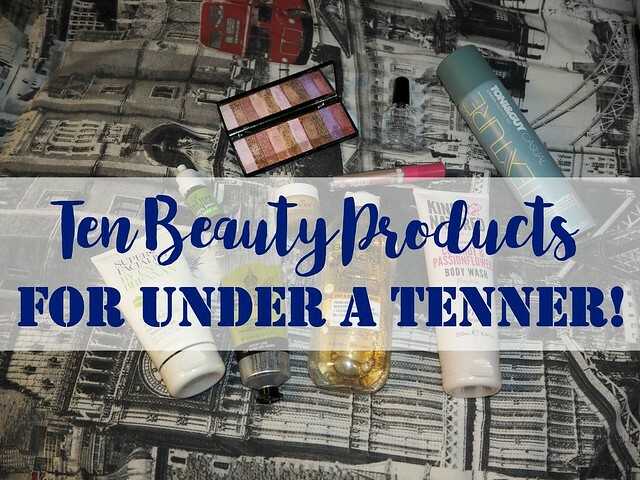 I've been having a little think lately about some of my favourite affordable beauty products and thought I'd put together a wee list of the gems you can pick up for a tenner or less! Una Brennan SuperFacialist Salicylic Acid Purifying Cleansing Wash | £7.99/150ml | My all-time favourite facewash; I cannot sing its praises enough! It smells gorgeous, it's super gentle and non-drying on my skin, yet by some form of magic seems to really help keep my skin looking clear. Nuxe Rêve de Miel Ultra-Nourishing Lip Balm | £8.55/15g | A blogger cliché, to be sure, but it's a cliché for a reason - it really works! I'm not a huge fan of the scent of Nuxe products, but I can kind of overlook it because of how great this is for hydrating dry, chapped lips and leaving them good-as-new overnight. Toni & Guy Casual Matt Texture Dry Shampoo | £7.49/250ml | I admit it's more than I'd ideally be spending on a dry shampoo but it's my ultimate favourite... No white residue and it actually leaves my hair looking presentable - my scalp is super oily so many dry shampoos fall short, for me. Garnier SkinActive Oil-Infused Micellar Cleansing Water | £5.99/400ml | This is so gentle on the skin and doesn't sting my eyes, meaning I can use it to remove all my make-up in one go - no faffing for me! You just shake to mix the oil with the water, soak a cotton pad and swipe over the skin. Obviously I only use this as a pre-cleanse, I wouldn't depend on it as my only cleanse. George Highlight & Define | £3.50/12ml | This is pretty much a perfect dupe for Benefit's High Beam but at a fraction of the price and, in my opinion, with better packaging. It gives a lovely glow to my skin without being overtly sparkly. I love it! Sally Hansen Hard As Nails | £4.75/13ml | I'll admit I'm useless at remembering to use this, partially because I rarely get chance to paint my nails anymore, but when I do remember, it gives a lovely glossy finish and makes a great base for nail polish. MUA Luxe Eyeshadow Palette in 'Paradise' | £8 | This has been my most-used eyeshadow palette since I got it, it's got such beautiful shades in and they wear really well. The price belies the quality, I'd happily pay twice that price for it! Tea Tree Oil | £1.88/10ml | Tea tree oil is an absolute staple for me, I don't have a favourite brand (this is just a cheapy one off Amazon!) but I love it to just dab onto spots, as I find it really brings the redness and soreness down overnight. Kind Natured Coconut & Passionflower Body Wash | £4.99/250ml | This smells gorgeous and, being SLS-free, it doesn't irritate my eczema - it just leaves my skin feeling clean and super-soft. Love! I've got a post on Kind Natured's bodycare products so check that out if you'd like to learn more about this brand! The Body Shop Hemp Hand Protector | £5/30ml | Cheating a little here because the photo shows the big 100ml tube which is actually £11... But you can get a smaller tube for under a tenner so I'm counting it! Nothing else works quite like this to soothe and heal my eczema-prone hands. Have you tried any of these products? What are your favourite affordable beauty products? I'd love to hear about them! Always good to get affordable products, but also knowing they are reliable. That age old tale, told by magazines and bloggers alike, you don't have to spend a fortune to get decent cosmetics. Ooh some good picks there! Makes me wanna go shopping!! I love garnier Micellar water but haven't tried the version with oil. I do have dry skin so I think I might pick this version up next time I run out. I'm still searching for my favourite dry shampoo, so I'll have to give the Toni and Guy one a go! I also love the Hemp Hand Protector from the Body Shop. It smells so good! 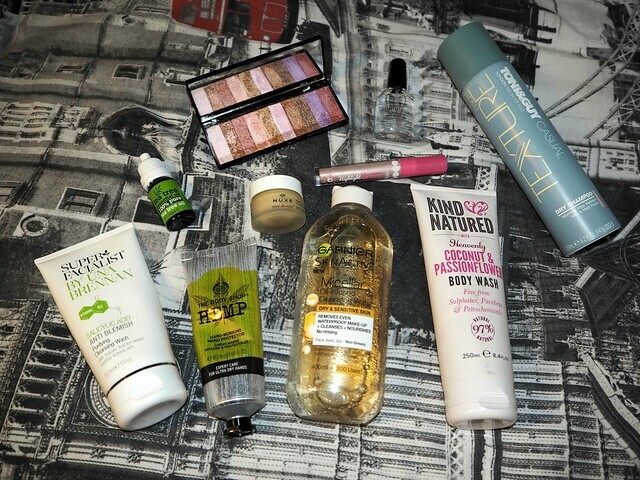 I love finding good quality affordable products, nothing beats a good bargain! The eyeshadow palette is stunning. The Garnier oil infused water is lovely. The make up wipe equivalent are great too!